Your pre-check of the used car, truck, van or SUV should be equivalent to most people's inspection. First of all, you have to like the automobile. Take a look around the automobile to see if it is worth spending the time performing a thorough check. Depending on your price range, most automobiles will pass. Look for obvious signs of neglect. 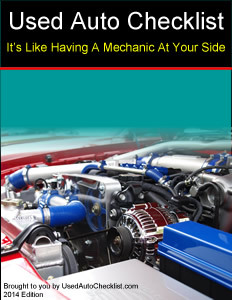 If the automobile is missing the engine, transmission, or similar crucial items, it might be a good idea to forget it. If you found the automobile through the classifieds and have doubts about it (too good to be true ad), you should ask if the automobile is roadworthy before you see it. This is especially true if it is an older automobile. If the automobile doesn't pass your pre-check, go back to Step 6. If it passes, go on to Part II.